Archaeologists in Kazakhstan have recreated the impressive attire of an ancient Scythian princess from fragments discovered in a treasure-filled burial discovered two years ago in the Terekty district of Western Kazakhstan, according to a report in Tengri News . The have also placed on display the unique golden artifacts found in the grave of the princess, who has been dubbed ‘Golden Woman’. 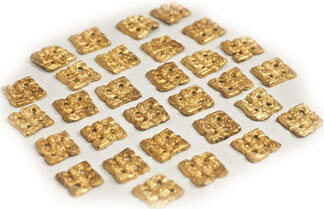 Dating back 2,500 years, it is the oldest golden burial to have been unearthed in the country. Goldan Woman was found buried in a mound, known as a kurgan, alongside numerous gold and silver vessels, makeup kits, golden jewellery, a headdress, a horse bridle, and other household items that were considered essential for the afterlife. The features of her burial are characteristic of Zoroastrianism, an ancient Iranian religion and a religious philosophy, which spread eastward towards Kazakhstan. The princess belonged to the Saka (ancient Scythians), a group of nomadic warrior tribes of Iranian origin, who inhabited the steppes of modern-day Kazakhstan from around 1,000 BC to the first centuries AD. In total, more than 500 different golden fragments were found in her burial, which earned the woman her name - the Golden Woman or the Golden Princess. 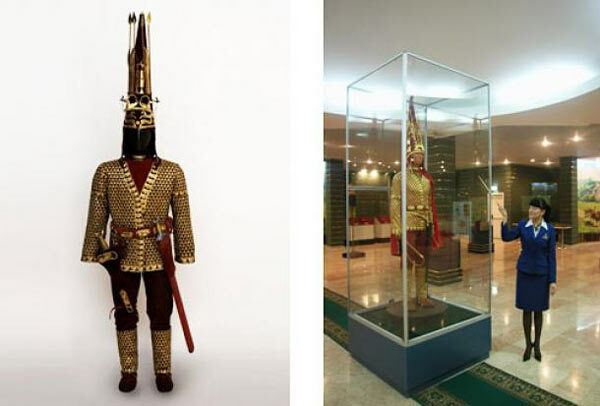 Reconstruction of the garment was entrusted to the famous restorer Krym Altynbekov. Thanks to his work, one can now see what Golden Princess might have looked like 2500 years ago. She was covered with a blanket embroidered with golden plaques of four types: differently shaped geometric pieces depicted ram griffins, rams, griffins and swastikas. Scientists call them solar, implying worship of the sun characteristic for the nomads of the time, which is also supported by the "Avesta", the core collection of sacred Zoroastrianism texts. One artifact that was of particular importance was a wooden comb depicting a battle scene in the war of the Saks against the Persians. The composition shows two soldiers in a chariot and their enemy, a single foot soldier, inscribed in the rectangular space in the center of the crest/comb. The discovery of the ancient Scythian princess is not the only golden kurgan that has been found The remains of the individual, known as ‘the Golden Man’ due to the abundance of jewellery and gold-plated armour adorning the body, were dug up in 2003 during an archaeological excavation of a burial mound in Shiliktinskaya Valley. It is believed that they are that of a leader of the Saka tribe, a branch of the Scythian nomads that populated Central Asia and southern Siberia about 3000 years ago. Although the remains have come to be known as the 'Golden Man', there has been some debate over whether the individual could have been female - the Scythians were known to have female warriors. More than 4,000 golden pieces were found adorning the Golden Man. Since the discovery of the Golden Man, the area suffered a series of problems including floods, a drought, high atmospheric pressure, storms, heavy snowfall, a mass loss of livestock and an increase in births of children with learning disabilities. As a result, there was widespread unrest among the locals who claim the calamities were caused by a curse and campaigned for years to have the warlord reburied to ‘appease his spirit’. While archaeologists and scholars have argued that the areas’ problems are simply the result of climate change, the Culture Ministry ordered the body of Golden Man to be reinterred in June, 2013. 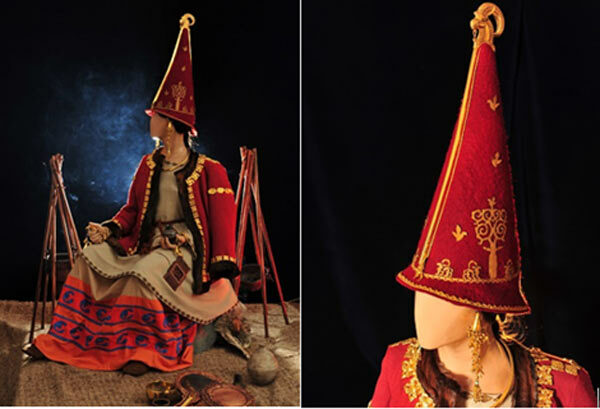 Featured image: Full garment and headdress reconstruction made by Krym Altynbekov. Photo courtesy of Krym Altynbekov . sorry but weren't the Scythe blond according to the Mongols ,how could they come from Iran ? here is something to read for you.. link. 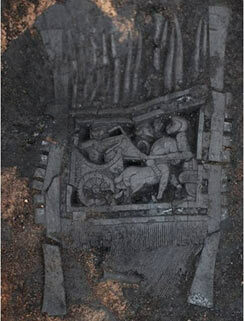 Sorry but weren't the Scythe blond according to the mongols ,how could they be from Iran ? I find the most interesting part of the article to be the ending when they talk about the Golden Man and all of the disasters the local people attributed to him. Where does it say the Golden Princess may NOT have been blonde?